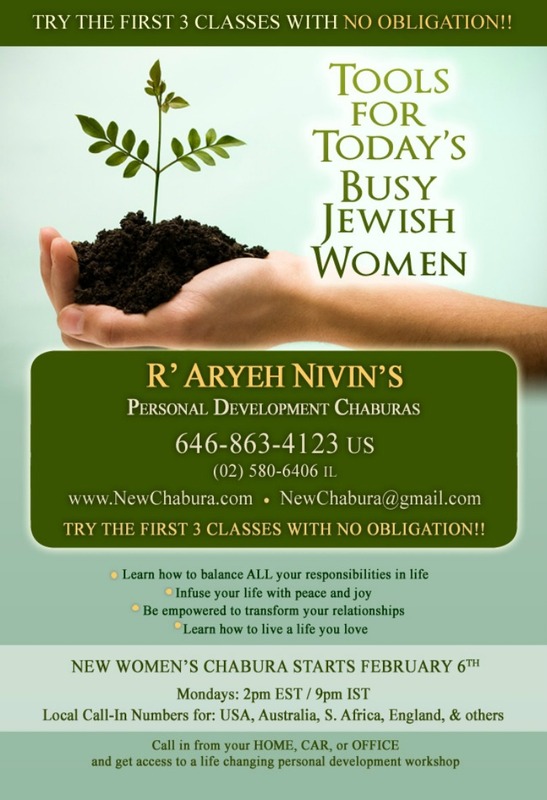 This Monday, my teacher, life coach Rabbi Aryeh Nivin will be starting a new Personal Development Chabura. I highly recommend this life-altering Chabura to every JewishMOM reading this. For me, the Chabura has improved my life DRAMATICALLY in so many ways. The first 3 classes will be a no-obligation free trial, and every JewishMOM.com reader who signs up for the free trial will automatically enter the raffle to win a free 12-week course registration (worth $150). This means that you have nothing to lose, and everything to gain by trying this out. Read one woman’s story about how Rabbi Nivin’s Chabura enabled her successfully make aliya, against all odds…I know the wonderful subject of this article, she lives in Nachlaot and found a job she loves at Nefesh b’Nefesh– a true aliya miracle. As told to Yoni Schlussel. “I couldn’t believe it! Rosh Hashana rolled around, and again no progress. For the past three years, I had been stuck in the same situation. My life was on hold; I was trying endlessly to find a good job so I could have enough money to live my dream of going back to Israel, but nothing was happening. Four years prior, I had held a distinguished job with considerable potential for growth. Since I never had the experience of studying in Israel, I decided to take off for three months for that experience. In Israel, I was learning, growing and enjoying so much, that three months quickly became ten. I knew before leaving that my company could not hold my job, but I felt it was worth the risk and hoped it wouldn’t take me long to find a new position. Unfortunately I was wrong; I was only barely able to find part time employment. Because of my financial constraints, I needed to move back home to my mother’s house; which at my age (29) was pretty depressing. I planned to stay at my mother’s for a month or two until I found a job, but that quickly turned into three and a half years! It made no sense. I felt like I was putting in 100% hishtadlus (effort) with no results; I spent hours at my computer, had my resume professionally reviewed. I had good contacts, great references, lots of experience, a degree from a good college, and had many interviews but never job offers. I had no money and couldn’t find a job. I felt stuck; I couldn’t move to Israel when I was barely making ends meet without paying rent and I was desperate for a breakthrough in my situation – and it was obvious that sending out resume number 1,001 wasn’t going to do it. I knew I needed a very different year than the past three. I decided to take Rabbi Aryeh Nivin’s personal development course. I resolved to do something I hadn’t done before since all my many efforts weren’t doing anything. In his course I learned about the concept of “chutzpadik masterminding”. He taught that we often limit our lives based on our own narrow thinking . The idea of this tool is to empower yourself beyond the typical line of logic and expand our narrow thinking; for example to make double the amount of money in half the time. One of the questions he had us reflect on was: “Do I really believe Hashem can do anything?” That inspired me to put more energy into davening for this than I had ever done before. I joined a forty day “Perek Shira” group and spent many hours davening, saying Tehillim and talking to Hashem in my own words. I also listened to inspirational Torah to keep myself motivated and to help me be clear that this situation was a result of Hashem’s hashgacha and nothing else. I realized that if I do believe, then why wouldn’t I try? I decided not to restrict my thinking and to move ahead with my dream of making aliya despite the fact that I was totally broke and barely employed. I constantly reminded myself that that Hashem is in charge of my life, not the economy. I also started work intently seeing the blessings in my life and being grateful for all that Hashem has given me. I put fervent effort into davening; asking Hashem for help to live my dream. I kept telling myself that Hashem is not limited; He can do anything- even get me to Israel. Less than a year later, I am thrilled to be telling my story from my apartment in Israel. The route I traveled to get here was truly supernatural. Many varied details came together flawlessly including the money I received from my tax return and a grant. Most miraculous was how at the last minute, a family member wrote me out of her estate so she could give me the money now which enabled me to move here! (Originally I asked a relative about approaching this lady to help and she told me absolutely not. Surprisingly, on her own she ended up asking for me and it all worked out perfectly!) Even more amazing is within 5 weeks, I actually found two jobs here! I love the work and am thrilled to be in Israel. I have no idea where this woman who had no money – found the money to join the chaburah! I’ve wanted to join a long time ago – from the beginning of your blogging about it – but I don’t have the money lying around to join. It always bothers me when people say “even when you don’t have money – for THIS your should splurge” like cleaning help for example. When people say they don’t have the money, they REALLY don’t have the money! Where does all this ‘ but for THIS I’ll pay ‘ come from?! I understand, Sara. It should also be clear that the chabura extends for an indefinite amount of time – every 12 weeks it’s another $150. Don’t get me wrong, I totally support that R’ Nivin must make a parnassa. Participants should sign up with eyes open, though – you never come to a definitive “end” of the course. 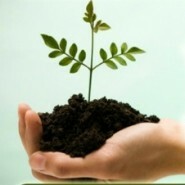 The learning is great and I only wish I could make it work for me – both financially and time-wise. For me the call is in the morning and I have, baruch Hashem, many small children. Calling in at night to hear the recording left me snoozing (not from boredom – just exhaustion!!!) I look forward to perhaps participating in the future. Elisheva I had the same issue…i had a hard time with the timing but I took notes of the recordings when I was more awake…and I only did the first part…and whats really important is to digest the first 12 week course…even after I finished and I was asked if I wanted to continue I explained that there was so much info in the first part I just want to be able to fully use the info I got…it also depends on your availability…i also have very small kids and work so I am still in the process of reviewing last years notes…it just helps u stay in focus and gives u tools that take you through self exploration, contemplation, observation, admiration…lots of good stuff..something you wouldnt do for yourself otherwise…especially all us busy moms..
Sara I felt the same way last year when I wamted so bad to join the chabura…the first 3 classes really got me and I paid with a creditcard while praying that it was a worthy investment in Hashems eyes so that He could help me pay for it…I am also calling from israel so that too was expensive, but I have to tell you a few things…this course gives you direction and THE way of life…meaning R Nivin teaches the words of the ramchal on how to have your entire life on a piece of paper which you look at and edit on a daily basis…its life changing because you are at work with yourself on a daily basis reviewing your feelings (heshbon nefesh)your household, and this gives you vitality to go after what goals you set…the tools and teachings are an investment for life…its not a splurge on something that runs out or becomes outdated…plus theres so much assistance and feedback…he sends out notes and has an assistant that is available for counseling… you get a whole lot for the money..plus you know you arent going to hire cleaning help ..we discussed that..remember? I loved the chabura because it helped me organize my mind and soul simultaneously…good luck. I HIGHLY recommend this chabura. it will DEFINITELY pay for itself with all the wisdom and “kochot” you get to make incredible changes in your life. p.s. – CALL USING SKYPE. that way you don’t have to spend money on the calls as well. I thought skype charges for calling…more info please…yaara…are u from netivot perhaps? for those who want to call from Israel, I have an AMAZING deal from Bezek International for around 7 agorot a minute. I spend many hours on the phone listening to classes, and my monthly international phone bill is like 70 nis. Money is a hard issue! It seems so real. But budgeting is only half of the story. Money really comes from Hashem to support us in our missions. So you being willing to spend what you don’t have to enhance your mission will just make Hashem pay it! Payment plans or credit cards are for such issues. I live very frugally, and I know the feeling of “I know I should but I can’t pay for it” very well. My advice would be to ask a mentor. They can tell if something is really important and worth borrowing for (and Hashem will sponsor in the end) or if you are justifying it! Sometimes being too practical is just not practical, it is cutting you off from the sources of money! is not an expression of emuna, but a lack of emuna. If you truly believe that Hashem can do anything you will wait until He gives you the money for the course. According to Rav Brody, you should just have an account with no overdraft facility, and no credit card, and when you need money for something ask Hashem, not pay first daven later. (I’m not claiming to be on this level, but it is something I aspire to,B”D). If you say so – I still don’t think asking my husband for $150 from his hard working money for a chabura is right. He’s trying to make rent and tuition here – what Rabbi Nivin is teaching is wonderful, but from all the examples everybody is bringing – it sounds like a lot of what we women can think about ourselves. We all know this stuff, it’s inside of us, we were born with bina and seichal. Sometimes some people just need a push to start thinking, but it’s nothing new. If you sit and really think about your life, and talk to Hashem, you can come up with some solutions with Hashem’s help and by yourself. He is not going to solve everything! I don’t mean to put him down, I’m helping those mothers who just can’t do it – be realistic and realize that our lives can shape up and be wonderful all by ourselves! Sara, I totally agree with you. I’m not knocking what anyone else is doing either and if Rav Nivin helped people that’s great. But you can listen to shiurim for free and grow in emuna, and even create a group of like-minded people to share with for free. The last few years haven’t been easy for me, but I was lucky enough to find Rav Brody’s shiurim on the web and they helped me a lot to grow in emuna. When you write “He is not going to solve everything”, are you referring to Hashem? Because if so, everything is Hashem. Each of us have to make our effort according to our level, but that is also from Him. There is no separation. We make our effort and He gives us the result (which is not always what we want). I can also recommend Rav Arush’s books, In the Garden of Emuna, and The Gates of Gratitude. I have them both (in Hebrew) and can lend them to you if you like, and you find them in English too. These books are life-changing. Not about the Chabura, but about the money – those of you who are suggesting credit cards and payment plans have no idea what truly having no money is. There are no credit cards. They are all closed, you are trying to pay them but can’t, and are being called regularly and have to show up in court to defend yourself that you didn’t mean to spend what you can’t pay. Very attractive settlement options are offered, but you just don’t have the money. You have left a bank because after $300 in bounced check fees you couldn’t afford to deposit more money there and you now can’t open another account anywhere, as they have you blacklisted. You are lucky you had another account around from before. When you run out of diapers, you daven. You put in $2.00 of gas (a half gallon) at a time, in nickels and pennies borrowed from the pushka. You have no regular paycheck, your job is freelance and sporadic. The concept of budgeting is amusing. You KNOW that certain expenses would help you long-term, but are they more worthwhile than the electric bill? You can’t make payment plans, because it takes a navi to know if you can afford the (even small) payment next month. You thank Hashem for the government, otherwise you would have no food. You wonder if it’s worth it to cut more corners, because it makes you LESS productive and your children less happy. Should you turn off all the lights and get depressed? Keep the house colder and risk your babies getting sick more often? You haven’t bought clothing for years. You hardly ever buy something new for a child – even though their boots are the wrong size and your daughter is wearing a hand-me-down coat from her older brother, or someone else’s hand-me-down with a broken zipper. But you thank Hashem every day because you are still here, in an apartment, with electricity, heat, and food – and even the phone/internet bill (which you need for parnasa) – even though Chaburas and such are impossible for you. And you know, that one day IY”H when you get past this hurdle, you will truly understand what it means to have no money. And it won’t take a huge leap of imagination to understand those who have even less than you.